Let your child rule the caveman tribe! Ooga Booga! Who's ready to go hunting for saber tooth tigers? Who's ready to discover fire? Who's ready to lead their pack of dinosaurs into battle? Your child will be when they go in this terrific ride a dinosaur costume! It's a fun look, that's sure to bring a little excitement to your prehistoric party! 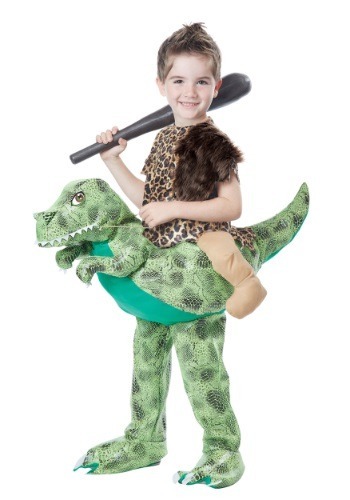 This costume (which may or may not be quite 100% historically accurate) will give your child the ability to take control of a fierce prehistoric predator, right in your own home! This child's costume will give them a jurassic dinosaur mount, and complete the look with a caveman details that will let any child pretend to be clubbin' around! The fun soft-sculpt dino sits comfortably around the waist, and even has faux human legs attached to complete the illusion. But since the wearer's legs will be in the dino print bottom, they'll be able to control those jurassic feet while they stomp around town. Let your little one head out on Halloween with this look, and we're sure that by the time they've made the trick or treating rounds, your cave will be filled to the brim with delicious treats! All the other cave people are sure to be impressed when they see your child's cool dinosaur... and the candy probably won't make a bad impression, either!